This post is an alternate post to my main width sizing post, which is intended to help those pick the best width for a snowboard, based on the waist width. This post, on the other hand, is intended for those who have already purchased their snowboard and want to test to double check that the width is going to be ok for them. It may be the case at this stage that it’s too late to exchange your board, but you just want to know how close you got. Or maybe you can still return the board (but be careful about putting bindings on if you might still want to return the board, as sometimes stores won’t allow returns if it’s obvious that bindings have been on the board). If you are looking for a board but have no way of testing for width with the actual gear in your possession, then estimating based on waist width, compared to your foot length and boot length, is the way to go. But if you have your gear already and are looking to test, read on. This is getting pretty technical, but if you have a protractor, you can measure the angles between the toe and heel of your boots and your board. This is pretty technical, but also a pretty accurate way to see if you have are likely to have too much overhang. What are the right angles for me? I would add to this that you can have smaller degrees on your heel side, IMO. So, if you like to really get up on your edge and do big carves, then you’ll naturally need a greater angle to work with, so you can get on a greater angle, without dragging your boot in the snow. But, as you’ll see in the pictures further down, having something like 60-65 degrees, doesn’t mean you can’t carve, or can’t get up on your edge at all, and that you’ll have to flat base it everywhere! You can still really get up on edge and carve. But you run a greater risk of drag, if you are really getting some deep carves in (like Euro carving). For most, something between 65 and 70 would be optimal, in my opinion. And you can get away with smaller angles on the heel side than on the toe side. Note: In softer snow, where the edge of the snowboard can dig deeper, more of an angle is needed, but you’re still not likely need more than a 65 to 70 degree angle, unless you’re a big carver, in my opinion. And not even that much on the heel edge. As you’ll see below, anything around 75 degrees is a big angle, more than most will ever need. Remember, if you can still return the board, I would be careful about mounting bindings to your board. In that case, it might be a better idea to use the “Testing to see if Your Board is Too Wide” method further below, instead (it can be used to see if your board is likely too narrow as well). WARNING: Remember I said this is getting pretty technical now – you’ve been warned! Strap your boots into your bindings and do them up tight like you would when riding (if they’re not done up, then the boot won’t be as far back into the heel as it would be when riding and wouldn’t be an accurate picture of what the overhang is like when you’re riding). Place a ruler so that the zero is at the metal edge of the snowboard. Depending on the ruler this might mean having a little bit of the ruler under the board – i.e. if the edge of the ruler (like mine) doesn’t start at zero (see image below). I find measuring in centimeters, rather than inches is best as it’s a more accurate measurement, but inches is fine too. In my case, as pictured in the image below, the overhang of the toe edge is 1.1cm. And on the heel edge it shows 2.6cm – not the greatest of centering but it does the job (more overhang on heel than toe edge is preferable). These pictures also show the other measurement we need for step 2. Note: if you’re doing this at the same time as measuring your overhang (like I did), add 0.1cm as that will be roughly the thickness of the ruler that’s lying flat. Important Note: A lot of rulers don’t start at zero. So you’ll need to measure what the gap on the ruler is from the edge of the ruler to the zero mark and add that to your height measurement. In my case I measure a height of 3.7cm on the toe edge – but I need to add 0.9mm for the gap between the start of the ruler and the zero mark and also 0.1cm because I have it sitting on top of the ruler that I used to measure the overhang. So it’s a total of 4.7cm. For the heel edge I measure 1.5” (that side of my square ruler is only inches and in this case, I had to use the short side to measure or else the heel cup got in the way). But converting inches to cm this comes to 3.81cm. There is less of a gap between the edge of the ruler and the zero mark on this side of the ruler – this time 0.4cm – that and the 0.1cm for the thickness of the ruler underneath and I get 4.3cm. Now we have the measurements we need to draw the triangle. The reason I do it this is way is that it’s hard to get a protractor in the right place to measure the angle directly – and this way you also get accurate overhang measurements. Draw a line vertically from your horizontal line that is the height measurement you obtained in step 2. In my case this was 4.7cm. Draw a second triangle for the heel side. In my case the horizontal line is 2.6cm and the vertical line is 4.3cm. NOTE: The toe of the boot usually (always, as far as I know) has more bevel – so will usually be higher off the ground – that and often the toe ramp (aka gas pedal) will also be angled up at the toe making it higher again). Follow the angled line to and read the angle on the protractor. To get a visualization of the angles that are being measured here, check out the image below. Alternatively you could use trigonometry to calculate the angle (thanks for pointing that out Zach!). Particularly helpful if you don’t have a protractor. The angle we are looking for is the bottom right one. In this case it’s 76.8°. With my protractor I had 77° – so pretty much the same. Though using this or trig will be slightly more accurate than using a protractor, of course. In an ideal world, with this setup, I would have a 2cm overhang on the heel and 1.7cm on the toe, or something like that, which would give me a 70° angle on the toe and 65° angle on the heel. But this setup works for me and I haven’t had any heel drag issues nor any slowness of turns on the toe side. I might get a little more performance with a slight shift but it works well enough for me, and it may not be too noticeable. 77° is way more than I’ll ever need on the toe, IMO. If you look at the image below you’ll see that I had to hold the snowboard up because there was so much angle that it wouldn’t sit by itself on the toe side. And the actual impact point was the top part of the white part of the toe of the boot. I actually measured my impact point to the bottom part of the toe of the boot – so the 77° angle I calculated could potentially be even higher. Afterwards, I placed something in behind the back of the boot and measured a 3cm overhang and when I did that, the impact point became on the bottom part of the white part of the toe of the boot, as expected. And the board was able to balance on the toes of the boots without holding it. I can’t imagine too many situations where this wouldn’t be more than enough for a majority of riders. The 2.6cm overhang on the heel side is above what I would usually suggest as a maximum for overhang, but for the heel side, this will usually be fine. And 60° seems to be well enough for my heels as I’ve never noticed any issues, even in deep snow. Again, ideally, I’d have them more centered but this is the easiest way to set them up with my particular binding/board setup and it works where it is. As you can see from the picture you have to get pretty low before the boot makes impact with the ground. Of course, remember in softer snow where the edge digs in further, the ground will be closer to the boots, but I’ve found this is still enough. It’s probably the limit in terms of angle that I would go on the heel – and I personally wouldn’t want less than 65 degrees on the toe but like I say, I haven’t had any issues yet. Vans boots (the boots I used in the examples are Vans Auras) tend not to have a lot of toe or heel bevel. Some boots will have even less, but most will have at least this much or more. With more bevel, the vertical line of the triangle (as calculated in STEP 2 above) will be longer – i.e. the boots impact point will be higher off the ground. In this case the angle will be greater – which gives more leeway for greater overhang. This is a tough one, because some boards are designed to be “too wide” – like short/wide powder boards that get their surface area from width, and counter that extra width with a shorter length. In that case, if that’s the type of board you have, then this won’t be useful. But for a traditionally shaped snowboard, it’s a really good idea to have your feet going from edge to edge, or as close to that as possible. This is because it’s your feet, ultimately, that apply pressure to the edges of the board. So, if you’re feet are too far inside the edges, then you won’t get as good a leverage. This means that it will take more effort to put pressure on the edge, and ultimately slow down turn initiation and increase the amount of effort to initiate a turn. Note: You can also use this to estimate whether your board is too narrow, if the technique above sounds too complicated or if you don’t want to attach bindings to your board, because you may still return it. Place your bare feet on the snowboard, at the reference point where the bindings go (or at whatever stance width that you use) and place it roughly on the binding angle that you ride at. Essentially place your feet where they will be when you’re riding. Note: For most people that a binding angle is usually max of around 21 degrees for the front foot and max 15 degrees for the back foot. Even though this sounds like quite a bit, it’s still only really a slight angle – don’t be tempted to put your foot on a 45 degree angle! You should be placing your foot on the underside (base) of the board, rather than on the top sheet. The width of the top sheet is narrower than the width of the base, due to the angles on the sidewalls. So, to do this, either hold the board on a angle standing up and place foot on it (as per image 1 below) or place it on the ground and lightly place your foot against the board (see image 2 below). Ideally your foot will be edge to edge, on the underside (base), or up to 10mm of overhang, total. Which would be 5mm over on the toe side and 5mm over on the heel side. You can also be up to 4mm inside the edges, total (2mm toe and 2mm heel). It will likely not affect your leverage if your inside by only this much. Note: 10mm overhang should be fine, so long as you don’t have boots with too big an outer-sole. The largest outer-sole I’ve measured so far, added 4cm total to the mondo (foot size the boot was designed for). But in a lot of cases, in my experience, people are in boots that are ½ a size larger in terms of mondo-print. In which case, there would be a 4.5cm difference between the length of the boot and foot size. 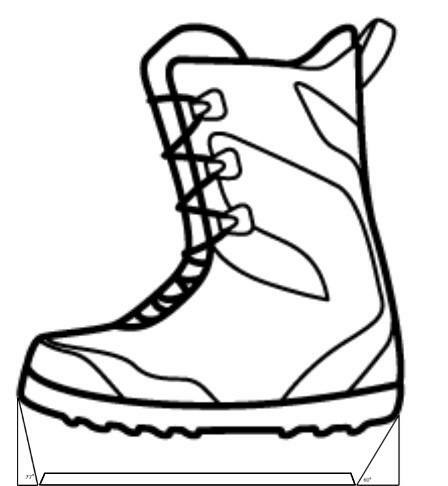 If you had that 10mm (1cm) overhang and had a 4.5cm boot-to-foot difference, then you would have 5.5cm of total boot overhang, which would be 2.75cm for heel and 2.75cm for toe. This would be pushing it in terms of having too much overhang, especially if you like to really get up on those edges and do deep carves. But if you have lower profile boots, then a 10mm overhang should be fine. The lowest I’ve seen is just a 1.7cm difference between outer-sole length and the mondo-print – though the wearer’s feet were 1cm less than the mondo, so the total difference was 2.7cm. But in that case, there would only be total of 3.7cm boot overhang, assuming a 10mm foot overhang. Which is just 1.85cm for heel and 1.85cm for toe, which is well within the boot overhang limit. Certainly a foot-to-boot difference of up to 3cm (for a total of 4cm boot overhang) is going to be perfectly fine, with a 10mm foot overhang. And even up to 3.5cm foot-to-boot difference (total boot overhang of 4.5cm, assuming 10mm foot overhang) is likely to be fine. O.k. that was a big note – still with me? What part of foot to what part of foot? So, the other thing to note, is that it’s the length of your foot, rather than where your foot’s contact points actually are. You’ll notice that when you place your foot on the board, that where your heel makes contact is forward of where the back of your heel actually is. Don’t worry about this, because when you roll back to do a heel side turn, the contact point of your heel is at the back of the heel. So, you should be looking to see where the back of the heel to the tip of the toe goes. So, it doesn’t matter if the contact points on your heel and toe are inside the edges. The measurement should be back of the heel in line with the heel edge and tips of toes in line with toe edge – as close as possible or a little over – and remember it’s in relation to the metal edge, so measure on the base of the board. Another way to measure this, which is probably more accurate, is to measure the width of the board at the reference point, at your particular binding angles, and then measure your foot separately and then compare those two numbers. E.g. One of my boards is 27cm at the reference point at a 15 degree angle on the back binding. My left foot (I am goofy) measures 27.3cm. So my feet are overhanging by 0.3cm (3mm). Basically, if you have more than 10mm of foot overhang total (5mm toe and 5mm heel), then you run the risk of the board being a bit too narrow. This is especially so if you have boots with quite a long profile and/or your feet are smaller than the mondo of your boots. So, in some cases, even having a 10mm total foot overhang could be pushing it, but if you have low or normal profile boots or if your foot size is the same as the mondo, then you should be fine with up to 10mm of total foot overhang. And I’m sure there are other factors I’ve missed too. Which is why it’s hard to predict, especially just off waist width, until you actually have your board in possession. So, sometimes, for peace of mind, it’s nice to check to make sure, once you’ve received your gear, that it will be suitable for you. It doesn’t have to be exact by any means, but you want to get close at least. Hopefully this post has given you some techniques to determine whether or not the width of your snowboard is right for you. Interesting that it overhangs at the front where you’ve got an 18 degree and not at the back with a 0 degree angle. But in any case, 8mm binding overhang is certainly not ideal. Even it that’s overhang over the top edge, that’s quite a bit of overhang even over the bottom edge. Do you have Union bindings by any chance (they tend to have longer base plates and their Large can often be too long for non-wide boards). If they are Union I would certainly recommend Ms for 10s. Not all bindings have any base plate extension but a lot do. If yours have an extendable gas pedal, it would pay to check if they are extended out – and potentially your front binding is extended and your back binding isn’t. For most brands’ (but not all) bindings you would be on the smaller end for Ls with 10s, in which case having the gas pedal as far in as possible isn’t a bad idea. Apart from gas pedal extension, I’m not sure what else to look at. The only other thing is potentially if your stance is setup quite narrow on the board and your front binding is on a narrower part of the board than reference stance width would be? Happy New Year and thanks heaps for your awesome website! I’ve learned so much about boarding from reading your info. After more than 12 years, my gear has totally packed it in, so I’ve taken the plunge to replace everything while up in the snow. I now have a Never Summer Proto Type Two (148), Malavitas (Medium, Mens). I didn’t notice any dramas with the overhang on the demo board I rented but after reading all your awesome info, I’m wondering if I bought too hastily. Planning to head out tomorrow for the first time on the new board, but probably not too late to swap if I really messed things up. I wear Burton Ritual (US womens size 9). Only a couple of days old, so still pretty tight. My old board was a Rome Solutions 154, (circa 2006). All the new boards/bindings I demo’d felt easy, light and sooo much fun. Now just concerned about the width/overhang. The sticker on the back of the Proto Type Two says the waist is 23.8, side cut (toe/heel) vario 740/702, tip/tail 28.2. I’m 170cm and up to 70kgs. And I ride duck foot 9 front and 9 back. I think the PT2 148 should have enough width for Burton US Women’s 9. You will have some overhang for sure, but some overhang is a good thing. So long as you can setup so you have no more than 3cm on the heel side and no more than 2.5cm (1 inch) on the toe side (measuring compared to the edge at the base, rather than the edge at the top sheet), then you should be fine. Could probably even get away with a little more than that, but certainly if you’re within that I would be pretty confident. Medium Burton Malavitas have a baseplate length of 22cm without any extension on the base plate, so you shouldn’t have any problem getting those on there either. Hey, thanks for all your advice. I’m a total noob and I just got my first snowboard. I still haven’t learned to ride. Since I had some doubts about it being too narrow, I measured the angles and it turned out my toe angle is 62° while my heel angle is 59°. Is that too bad? I’m wondering if it’s best to look for a new wider board or stay with this one. A 246mm waist is borderline for 9.5 boots. Usually if someone was to say they rode with a straight back binding angle, I would say that it’s a bit too narrow, but with a reasonable angle on the back binding, it should be fine width-wise. Since you’ve measured the angles, that’s awesome. The angles you have measured should be fine for you, as a beginner, IMO. Once you start to get more advanced and if you start to really get up on the edges and get into carving, then it could become problematic. But assuming you’ve bought a beginner suitable board, you’ll likely want to upgrade by then anyway. So, for now, I think you should be fine with this one. But when you upgrade you might want to go for something a little wider. Yeah, it’s a beginner board (it’s this one: https://www.wedze.co.uk/allroad-100-mens-piste-and-all-mountain-snowboard-black-wood-and-red-id_8398102) and it’s super cheap. And although I could still turn it back, get a refund and look for something else, I don’t think I’ll find anything better for that low price. With it being borderline, I’ll know I have to look for something 250-255cm next time. You’re very welcome Boyan. Would be interested to hear how you like it once you’ve had a chance to get it out on snow (if you think of it at the time). Hope it treats you well and you have an awesome season! My boots are fitting okay though I have an almost unnoticeable heel lift when I try to lift my heel too hard, but if they get too loose I’ll probably get a J-bar or something similar. Thx for the redirect to this article. Exactly what I had been looking for. Quick note, that once u have the measurements for the triangle, you can use high school trig (who ever thought! HA) to calculate the angle (Step 4). More exact, and who has a protractor laying around :). Using the arctan function. Even if u don’t know/remember trigonometry, you can just punch it into Google as “arctan(H/W) in degrees.” Where H and W are just the height and width of the triangle u measured. True – I didn’t consider using Trig, but totally. I did buy a protractor specifically for this purpose, but yeah, otherwise wouldn’t have a protractor just lying around! Firstly, to avoid confusion for others, it’s probably worth mentioning in the article to not use the “tipping the board on edge with the boots in” as any sort of guide, or if you do use it, to suggest that people de-camber the board by pushing down on the camber zones as they tilt up. This has a drastic effect on the angle board will tilt to. When tilted, a lot of boards will go near vertical, but when de-cambered, it will tilt to the same angle that you found from the calculations based on the over-hang. And to do this on a hard surface that’s non-precious, so as not to scratch your favourite table with the edges. Freeride rear binding: +9 (69.3 degrees toe side, 61.6 heel side). I’m in the process of making some 10mm risers to give me a bit of extra angle, and because I wanted a project to work on whilst at home recovering from a torn shoulder ligament. I’ll report back with the differences it makes for me. You’ve helped me a lot with your reviews and advice pages, so I wanted to try and give something back. Hopefully this info is of some use to you, or to my fellow big footed riders who want to lay over a carve. Thanks for your input and you make some great points. Will be interesting to hear how you go and how much difference it makes with the risers. I don’t tend to get super low no my carves – not a super aggressive carver – and certainly can’t get as low on my heel side. But I can still certainly carve on that angle and haven’t run into any heel drag issues. Good idea to show how it looks with a forward stance. I don’t tend to ride that kind of stance often these days, but can see how it would be helpful for those that do. Hope your recovery goes well – I know how long ligament and tendon injuries can take to heal – hope yours is a speedy recovery.